Wear appropriate and matching attire. For bands this means marching attire although formal band uniforms are not mandatory. Groups should come to the park dressed to perform (and play) as changing facilities are not available. Marching bands will cover a route on the main midway lasting about 20 minutes. Two performance spots are available, although the number of spots may be reduced or eliminated, depending upon the number of bands marching on that date. A performance application must be submitted, performances are on a first-come, first-served basis, and all must be finished by noon. After their final bow, your group can then enjoy a yummy lunch either catered or at one of the many restaurants, old and new, and then … on to the rides! For the less adventurous, Cedar Point also boasts dozens of other rides closer to the ground as well as two new games — Frontier Town Shooting Gallery, Western Shoot-out, and five new shows on the entertainment menu. For those looking for a little hands-on fun, there’s Fort Sandusky Mining Co., where you can pan for real gemstones, the chance to blow glass at the Glass Academy, and even dip a unique-to-you candle at the Candle Shop. And don’t forget Cedar Point Shores waterpark, where 18 acres of water slides, eateries, a wave pool, and more await! 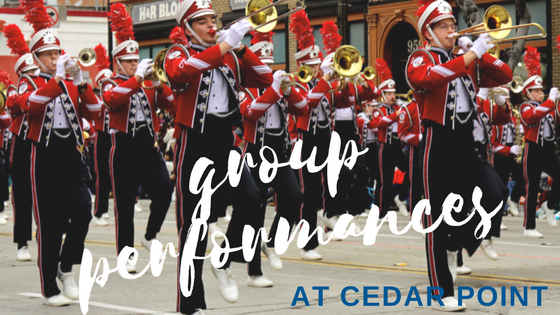 So, pack up your best musicians, choirs, and dancers, entertain visitors from all over, and become a part of the magic that is Cedar Point. Indian Trails has been taking groups to Cedar Point for decades and can help make your trip one of the most fun and memorable ever! Learn more about chartering one of our state-of-the-art motorcoaches and contact us today for a quote.